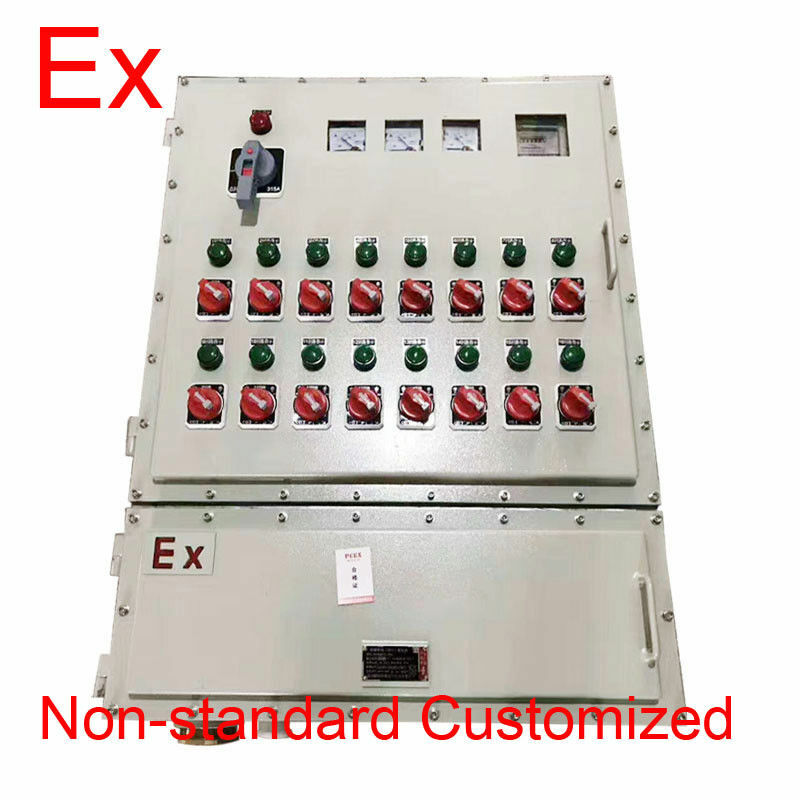 explosion proof distribution panel is designed and built to operate in environments where concentrations of flammable gases, vapors, liquids or combustible particles pose risks of ignition and explosion. The distribution panel enclosures are cast from heavy duty aluminum so that they cannot create a spark that could possibly ignite the vapors in a hazardous location. These heavy duty panels come with "O" ring gaskets to keep explosive fumes from entering the panel and are designed to contain an internal explosion without igniting the explosive vapors present in the hazardous area. explosion proof distribution panel also prevent interior explosions from spreading outside and posing a threat to life and property. 1. The housing is die cast in aluminium alloy, with high voltage static plasticsprayed surface. 2. Equipped with chief switch, having protections of overload, short circuit electrical leakage protection is according to equip with the user's requirement. 3. Various kinds of sockets are avallable for power. 5.Exposed fastener of stainless steel. 2) What is your quality control process? A:For each order, we do 100% testing for any of products before the order has been deliveried. We have QC team comply with TQM to ensure the quality. Each step is in compliance to the standards. At the same time, we will take photos and shoot video for you if you need, and we welcome you to arrange QC to check the goods. 3) Do you offer guarantee for the products? A: Yes, we offer1 year warranty to our products. 4) Q: What payment methods your company accept ? A: We accept most of the payment methods, but mainly accept T/T , L/C,Paypal,Western Union. 6)Q: What is our advantage in the industry? Our main advantage is high performance price ratio of our products, and positive service to our customers and partners. Our products are not the top grade of quality in the industry, and our prices are not the lowest as well, but the performance price ratio of our products is outstanding. 7)Q: How to proceed an explosion proof distribution panel? 8)Q. What about the lead time?